Nile - Perl App Framework Nile Nile - Perl Visual Web App Framework MVC Separating Code From Design Multi Lingual And Multi Theme. Backupawy backupawy.exe Backupawy is a windows desktop program to automate your websites and servers backup to local computers. The free version is the full version will never expire but will download only the first file in each directory. ieSnapshotter ieSnapshotterDemo.exe ieSnapshotter is a Plugin for Microsoft Internet Explorer that allows you to take screenshots and thumbnails of web pages and convert html or any files to images. Website Screenshot Pro SnapshotterPro.exe Snapshotter Pro. Snapshotter Pro is a Windows program that allows you to take screenshots and thumbnails of web pages or whole websites and convert html or text files to images. It is a visual interface for easy management and watching. The following image formats are supported JPG, GIF, PNG, BMP, TIFF. Website Screenshot Tool Snapshotter.zip Snapshotter. Snapshotter is a Windows command line program that allows you to take screenshots and thumbnails of web pages or whole websites and convert html or text files to images. The free version is the full version but will convert images created to gray instead of colors. Searchawy Snapshot Manager SnapshotMgr.exe Searchawy Snapshot Manager. This is a windows desktop program to automate our Searchawy software websites snapshots feature. The free version is the full version but watermark the snapshots images with some text will never expire. Demoawy Screen Recorder Demoawy Demoawy Screen Recorder. Demoawy is a Free 100% Windows program which record your Windows desktop activity in real time to AVI or WMV video files. Ideal for Presentations, Training and Support. Free will never expire full version. Fonawy Standard FonawyStandard.exe Fonawy Standard. Fonawy Standard is a Windows program which is Phone call recorder, answer machine, caller ID, dialer, and address book. Validawy validawy.exe Validawy is a Windows program that you use to live validate and clean up email lists files from bad emails address. Validawy is very nice and easy to use program, Multi-threaded up to 500 threads (concurrently connections), very fast, uses ver small memory, color code validation status for each email address, displays server response and error or success reasons. The free version will save only the firs 100 emails but will never expire. MSHTML Html Editor ActiveX HtmlEditor.zip Free Full Source Code in Visual Basic 6. MSHTML ActiveX Control Wrapper WYSIWYG full visual html editor component. Support every single function supported by MSHTML using IOleCommandTarget Interface. Supports also all table editing functions. Supports also a good starte for table selection functions that you can complete it the way it should. Also support events and functions names similar to discontinued DhtmlEdit control. Very easy to use. Before you load the project copy the Typelib file MewsoftHtmlEditor.tlb to your system directory. Free Full Source Code in Visual Basic 6. Source code editor with syntax highlighting for every language ActiveX Control OCX for VB and all programing languages that supports ActiveX controls. It is an ActiveX Control Wrapper for Scintilla Editor the free source editor from www.scintilla.org. Screen Shot Free Full Source Code in Visual Basic 6. Fully implements the drawing and control for Microsoft Word and FrontPage style drop-down table size picker. Lots of properties for settings colors, borders and events for actions very customizable. Based on Table Chooser Code I found somewhere may be VBaccelerator or here. PerlSharp PerlSharp.cgi Shrink your perl modules and scripts by more than 90% and parses and beautifies perl source to make your perl runs 100% faster. 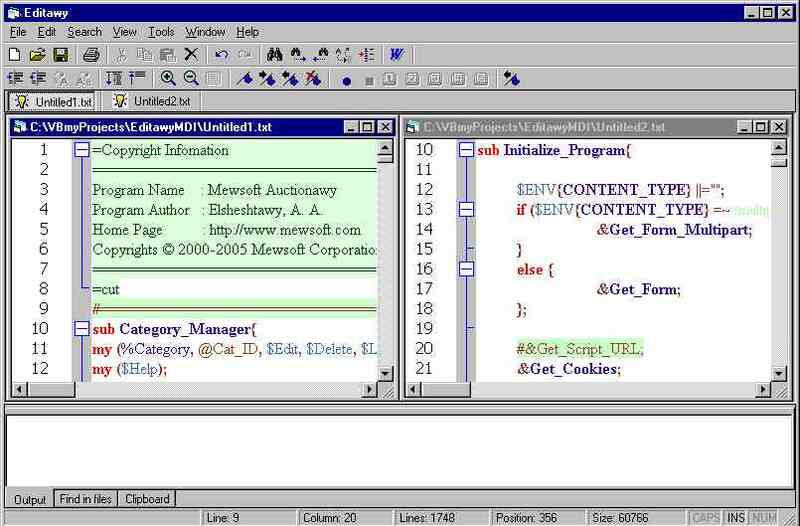 Webawy.exe Free Full Source Code in Visual Basic 6. Visual HTML (WYSIWYG) Editor. Free Full version with Source Code in Visual Basic 6. Uses Microsoft MHTMLEdit ActiveX, See screen shot below. This is a Windows desktop application program like Microsoft Frontpage with tons of features. Edit your html pages visually and also edit the source code.